A purple monster with wild curls spiraling out of control explains the economics of oil production in the Sudan to students in Los Angeles, Sydney, Berlin, Jerusalem, and Riyadh. 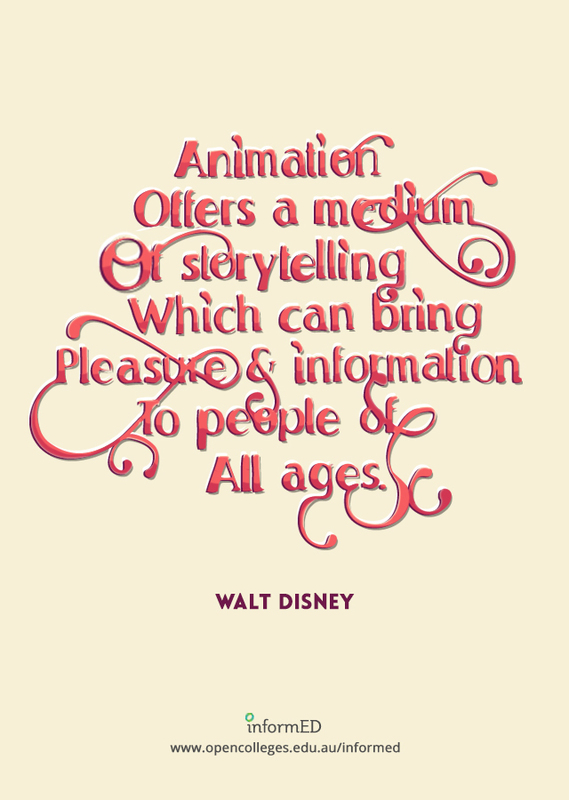 That is education and animation working together to teach students everywhere, everything they ever wanted to know. Educators need only utilize the tools available, most of them for free. Some of the animation links catalogued here will give educators very basic tools and histories of animation while others have the animation already created and set in motion, it’s just a matter of sharing it with students. Educators need to decide which tool is best for them. If you want to create your own animation from scratch, then you want to go to sites such as Animwork. If you want to select from animation that’s already set up for you then perhaps Explainia makes more sense. One of the easiest ways to animate, however, isn’t with your own camera and modeling clay, it’s with your links to sites that hand you everything within their own forums. Use the first part of this list for creating original animation or using animation tools to create lessons. Use the second part to select animated lessons that are already completed and set to share. In this support system for educators, iCreate to Educate helps teachers and schools from primary through higher education become better learners by making animation more accessible throughout Europe. It offers some great resources and valuable animation software and resources. It also has a free stop-motion animation tool called SAM. A European partnership created this guide to help teachers learn more about using animation to teach. With some basics in place such as how to create a good story and what tools to use, Animwork puts everything into perspective for any teacher who wants to create his or her own animation. Easy and quick, GoAnimate for Schools is a one-stop shop for creating custom animation that’s well-made and easy to use. Globally accessible to any educator, it’s also secure and educators get a major discount. Schools can sign up about 200 students at a time. If the purpose of using the animation tool is solely for teaching and sharing educator-created animation, take another route to GoAnimate for business. This tool has a free sign-in where educators can use basic tools to create animation with whatever message they need to get across to their students. Quick animation with some bizarre characters and sleek backgrounds that help make a point or send students into the beginning or end of a lesson makes Devolver a great tool for the educator who moves fast. Students can also use it to email professors their interpretation of a theory or lesson. Adding an interesting twist to communication and lecturing, Voki allows educators to create avatars that speak for them. Record or type in messages and send or embed the clips on a site. Voki even offers educator logins with free extras. A free business presentation tool, PowToon helps users create animated presentations with quality graphics. It even has a home dedicated to educators at any level. PowToon touts itself as being as easy to use as Powerpoint and educators seem to think it is. For those who prefer to draw, there’s Make It Share It. Create your own drawings from stick figures to sketches to full cartoons and animate them all online. This might be an online tool to share with students who like to draw or to create a project. But, if drawing seems to just get in the way, go to Wideo. Some modern graphics with interesting selections and fonts give users the ability to make unique videos for business and education. Nicely done tutorials provide users with confidence and basic skills to begin quickly. Hailing from the United Kingdom, this site is best used as a tool for students to create their own myths and legends. For instance, students might want to turn a factual news story into a myth or legend using the Myths and Legends tools. Make a movie or watch a movie with animation tools set neatly in place at Zimmer Twins. Create scenes from scratch or choose from scenes that are already set up. Educators can take advantage of Zimmer Twins at School by creating accounts for up to 40 students including blogs for added communication. For simple movements and creative elements of photographs or short film, use Loogix. It’s very basic and not as innovative or interactive but it gets the job done if the goal is to add a fun twist to images. A hilariously fun site, Blabberize turns any image into a talking image complete with your recorded message. Now, whatever point any educator’s trying to make is a lot more effective when a talking cat, dog, or lama says it. If there’s a need for something more tailored and none of the tools you’ve looked at so far meet your needs, try Aniboom. There you’ll find access to actual animators. Just post your project then assign an artist to it. You can check on the progress during the process. Another online animation tool has both a free limited version and a version that you can get a quote on for pricing. With a large variety of backgrounds and characters, using the premium version might be worth it. Creaza’s selling points are the video editor, an audio editor, a cartoon editor and a mind map builder. An app for ipads, iphones, and ipods, Doink offers really creative tools that allow users to customize artwork and to create a library of drawings and animations. With a composition editor, animation appears professional and adds more versatility than a lot of other programs out there. The following links will help educators find animation that’s already set in motion. It’s tried and true so educators simply search for their subject or their purpose and grab videos to help their students grasp concepts or even learn difficult material that otherwise may have eluded them. Here educators will find brilliant animation with unique twists on a basic concept add new dimensions to learning with TED Ed. The clips are usually short, approximately 5 minutes, but they squeeze important information into that time frame and do it rather effectively. Another site with quick clips, Brain Pop simplifies difficult lessons in all the basic subjects including engineering and technology. Like TED Ed, it adds material constantly so there’s always more to choose from; however, there is a fee to access the material. Walk through the architectural planning of the Colosseum, watch the reconstruction of the Iron Age Chariot, and learn about the Battle of Somme in World War I among many other animated insights. It can all be found at the BBC Interactive Content Animations. An Australian site full of insightful and entertaining documentaries, ABC also has cool animated videos about Greek gods, Naval officers, and science plus lots of interactive video and gaming. From learning how to save the oceans to how to calculate your body mass index, the animations seem endless on Explania. Just register and gain access to creative animations that explain almost anything. Google Apps for Education is filled with animated apps that shed light on otherwise out of reach concepts and difficult problems that sometimes even the best educator can’t perfect into a lesson readable by all students. GeoGebra and Desmos have sketchpads and graphing calculators and that’s just the beginning. RSA brings power to intellectual debates with animation. Use their videos as a springboard for further debate or to introduce 21st century topics to any subject that thrives on arguments. Full of informational animations that give the learner visuals that transfer difficult concepts into understandable snippets, Brainpickings narrows the gap between confusion and understanding. Openculture compiled a list of animations relating to various literature such as Emily Dickinson’s poetry and Shakespeare. Explain the wonders of Plato and Kafka as well as Hemingway with these short clips. Find folktales, comedies, minidramas, and more, all animated with fascinating graphics and sound on Electric Literature. Bring story telling to students with these videos that offer unique perspectives. With tons of videos to choose from, some aren’t animated but you can sift through them to find the animated ones. WatchKnowLearn.org is broken into subject areas and acts as a database for rated videos that teach students. The ratings have stars and a review, which is really helpful because it saves time when choosing which one to use. At the site for the National Film Board of Canada, educators will discover free streaming documentaries and animated films. Short animated films about poets, poetry, music, and other themes add interest and are a great resource for any educator. While housing all types of great resource videos, National Geographic also has valuable interactive animations for teaching about the world around us and the world itself. Click through the steps of Greenhouse Effect and learn exactly how it works. Sleek, professional, colorful, and detailed animations at BioInteractive help educators communicate their curriculum with students. Educators choose from topics such as anatomy, brain, cancer, cardiovascular, organism behavior, and a lot more. Using Google maps, The Archeology Channel has created an interactive map that gives educators a visual guide of its animated videos of historical figures and finds according to the country or region. For instance, if educators click on Italy, they’ll find a video about Matilda of Canossa. Full of videos, the animated ones make understanding any subject or process much easier at How Stuff Works. Under the category Culture, you might click on the animated video How Murphy’s Law Works. John Kyrk created intricate animations explaining cell biology. Beginning with amino acids and protein and delving into DNA structure, the animation available on his site provides learners with complete visuals into the workings of cell biology. Access well-made animations of flower structures, plant breeding, gel scoring, gene cloning, genetic mapping, herbicide metabolism and so on. Plant & Soil Sciences eLibrary allows educators to access and use animated videos for free after they login. Split into categories such as Astronomy or Cognitive Science/Psychology, educators can find animated videos depending on the subject within the subject inside Exploratorium. Find any and everything at iTunes U, just search or select a category and move through animation after animation. Sign up as an educator and add something even more useful to the equation by creating your own unique lessons or even videos. Massachusetts Institute of Technology offers open courses with some great animation available. Check out some of the courses available at MIT and send students that way if they need extra guidance or even if they need a good challenge. Inside PBS.org, educators have access to animations of such topics as growth, well-being, and jobs in what it calls the new economy or the story of Theodore Roosevelt’s building the Panama Canal. Another helpful place to find animations, YouTube delivers any and every animation on almost any topic or subject imaginable. However, educators might have to sift through some unprofessional videos while searching. Not just focused on science, Science Stage is worth visiting for almost any subject except literature. Anyone who wants to learn more about a chosen field will find all the videos fascinating, not just the animations. An animation of the Ã¢â‚¬Å“Island of StabilityÃ¢â‚¬Â for physics or animation of the growth spurts of a T. Rex give learners clear insight into the unseen worlds of learning on NOVA, a subsection of PBS. From sustainability of water to the science of the summer Olympics, NBC Learn makes education simple and understandable. The animations work alongside professional videos explaining various topics. History actually partnered with Aniboom and created a contest where people use Aniboom to create a historical, animated video. On top of that, History online has awesome interactive games, maps, and timelines including Ellis Island: Then and Now and hilarious animation of Greek Gods. If educators need animated video of science subjects such as biology, chemistry, and physics, then LearnersTV boasts animated videos detailing these subjects. It also catalogues video on such subjects as engineering and economics but those videos aren’t animated. At Maps of War, the history of religion, the Imperial history of the Middle East, democracy, terrorism, the World Wars, and more map out the past and sometimes the future, depending on how you look at it. Well-respected and known as the place to go for all learners, Khan Academy masters teaching and animation with videos that lead a student to the unanswered questions. See Math animations explain simple and complex math with animations that make learning precise and understandable. Educators can sign up and show the videos to students or have students sign up and learn. Animated cubes, triangular prisms, hexakis icosahedrons, gyroelongated square bicupola, or hebesphenomegacorona among other three-dimensional animated shapes fill the web pages of Math is Fun, offering learners various ways to manipulate and view the movements. If educators search Vimeo, they’ll find some nicely done animation of shorts about anything from sci-fi to love stories as well as beautifully done animation of challenging and enlightening concepts to spark creativity and innovation with any learner who needs a boost of imagination. A former Publications Specialist at Florida International University where she also received a bachelor’s degree in English, Lisa Chesser left the publishing field to pursue a career in education. In her first three years of teaching Language Arts, she won an Excellence in Teaching Award for helping students achieve 50 percent learning gains. Because she’s also a writer, an editor, and an artist by trade, students often take more interest in their learning environment because she teaches them the value of it in the workplace. You can find her on Google+. Great list! YouTube and Vine are two of the most accessible (or popular, depending which way you look at it). There are plenty of great apps which promote this kind of thing, too, and even games consoles like the Wii U have software which promote artistic creativity. Don’t forget traditional art as well, of course, with chalk pavement drawings and sketching. All part of creative development. When I was a kid I used to specialise in pasta artwork. I should try and sell it now at an auction, to be honest, I could easily make a few million. Agreed. There’s so much available to us that it’s hard to confine it to even a list of 50. The role of technology in education cannot be underestimated. Many methods have come up that seek to deliver content better using technological advancements. One way this is achieved is by using animated educational videos to teach a specific subject. This form of learning comes with several advantages. One advantage of using animation videos in learning is that it helps make content that is difficult much easier for you to understand. This is true especially when the subject matter is very dynamic. Animations are more superior to the use of two dimensional graphics due to the fact that better analysis can be derived from what is being displayed. Explaininja Studios is a full service video production studio that specializes in animated explainer video, and good idea. Our skills have also lent themeselves to projects as varied as training videos, stop motion presentations, cooking shows and wedding videos. We love new and interesting ideas, and get a kick out of understanding your, story, and telling it in the most effective way. However many of these on line hack resources occasionally require that you do review,to confirm you’re not is in many cases normal action to take,because our machines get ddos everyday by bots along with other fraudsters who wish to eliminate tournaments. compression to the decrease leg helping to reduce the strain on the muscular tissues. Also, Animatron (https://animatron.com) might be a good resource, too. It’s an online animation maker that allows creating presentations and videos right in the browser. It’s possible to create own animated characters or choose from hundreds of existing characters and props. It’s great for collaborative learning, since it allows several people to work on a project together in real time. Amazing piece of wok! I think Powtoon is the best-animated video maker, I always used it for my class presentations as it’s really user-friendly and even a beginner can easily learn from scratch without any tutorials.